1. Tegu Blocks. We went to our local toy store, Shenanigan’s, looking for first birthday gifts and I asked the woman: “Of all the toys in the store, what would you buy for a one year old?” Without hesitation she recommended these magnetic wooden blocks from Honduras. They are sustainably sourced, non-toxic, and made by a company with many honorable missions. M loves to carry them around the basement and smack them together. Someday soon he will be building towers like his dad! They are a bit pricey, but they seem like they will last – both in quality and in interest. 2. Manhattan Toy Stow and Go Cart. 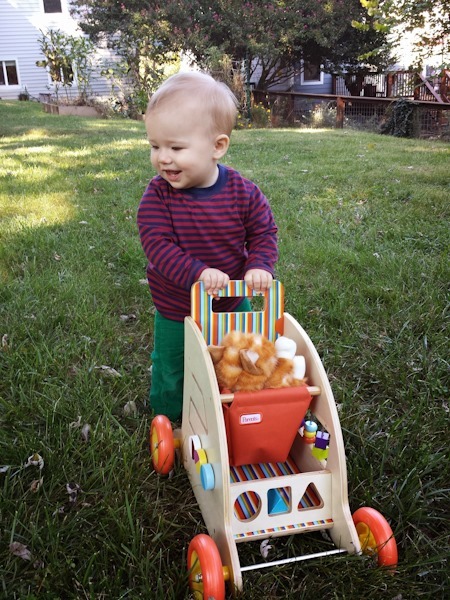 This cart is perfect for learning to walk, pushing around the yard and giving Pumpkin rides. 4. Hand, Hand, Fingers, Thumb. Our current favorite book! Matt taught M to pat his tummy as the drum, and now if you show him the book he pats his tummy on command. He smiles his way through this one. 5. Kidoozie Funtime Tractor. This one was another first birthday gift from us and M LOVES it. So do most kids who come over to play. The animals and Old MacDonald make noises when you push them, and if you touch the orange button in the front the whole tractor moves forward. Pumpkin likes to ride on it! What a clever toy this one is. 6. Kid-O Tip Truck. M loves this truck and also has the red car of the same brand. They have a timeless quality about them, and they are fun to roll on the ground. 7. Fisher-Price Brilliant Basics Corn Popper. M didn’t quite get this popper until he could walk, but now that he can it’s one of his favorites. He pops it all around the house! 8. Orange Tabby Kitten Puppet AKA PUMPKIN! I can’t believe Pumpkin is on Amazon! We bought M this cat puppet after he fell in love with it in a toy store. Of course she is named after our neighbor cat of the same color. M hasn’t shown much interest in any stuff animals except this one. He has started to cuddle with her and pets her. And he loves to walk around holding her by her tail. I added the laptop to my little Luke’s Christmas list! Can’t wait to see if he likes it as much as mazen! Mazen has great taste in toys!! May I suggest the stacking cups HEAB posted about? All 4 of my kids LOVED those. They seem simple, but we used those so much! My girls are 15 and 12 and they still pull out the wood blocks now and then. They used them to make roads, to make houses for stuffed animals, to make barnyards for their plastic animals. They will be a great toy for years to come! Would you mind sharing how you made that backgroundless composite picture? 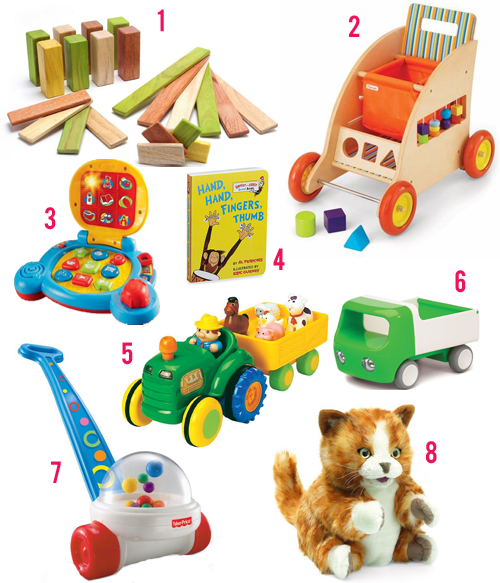 Also… the next time you are looking to purchase you should check out Green Toys. The company has an awesome philosophy and makes tons of adorable foodie items. I worked at a toy store when we lived in Buffalo and I had to stop myself from buying all of the Green Toy foods before we moved (you know, just in case I get pregnant in the next couple of years!). I may have some of those Green Toys. ..
and I made the design in Photoshop Elements. Created a blank file and dragged the photos on top. My daughter LOVED blankets. She didn’t have a certain one, but at all times, she had to have one around – she called it a ‘bee-bee.’ She didn’t care much about ‘toys’ until about 18 months, but she ADORED blankets. At 5, she still does. She covers up her ‘babies’ and at any given time, there is a line of covered babies in my hallway LOL. Great idea Kath! Shenanigans also recommended the old MacDonald farm tractor #5 and Ms C loves it! One of her favs is a vtec picnic basket too. This is an old question I know you have addressed but it has been awhile and I forgot what your decision was on Mazen’s last name. I just got married and I plan to keep my last name but if we have children I am not sure the direction I want to go. I was wondering your advice on this subject. Thanks! 🙂 Glad to hear this was helpful!